Today I wanted to show a casual way to still look really cute on Valentines Day! Most years I wear a dress and the whole nine yards. This year I wanted to do something different because I have really been into looks that are really comfortable yet still really cute and fashion forward! This shirt is absolutely perfect for that. What better day to wear this shirt then on valentines day! And it is your lucky day!! Today I have teamed up with ILY Couture for a amazing giveaway! It is no secret that ILY Couture is one of my favorite places to shop for jewelry! A lot of my staple jewelry pieces are from ILY Couture! So I am extra excited for today's giveaway!! ILY Couture has so graciously offered to giveaway a "wifey" t-shirt and a Kate crystal pink bib statement necklace that is pictured below (not the one I am wearing in the pictures) to one lucky SOS reader. 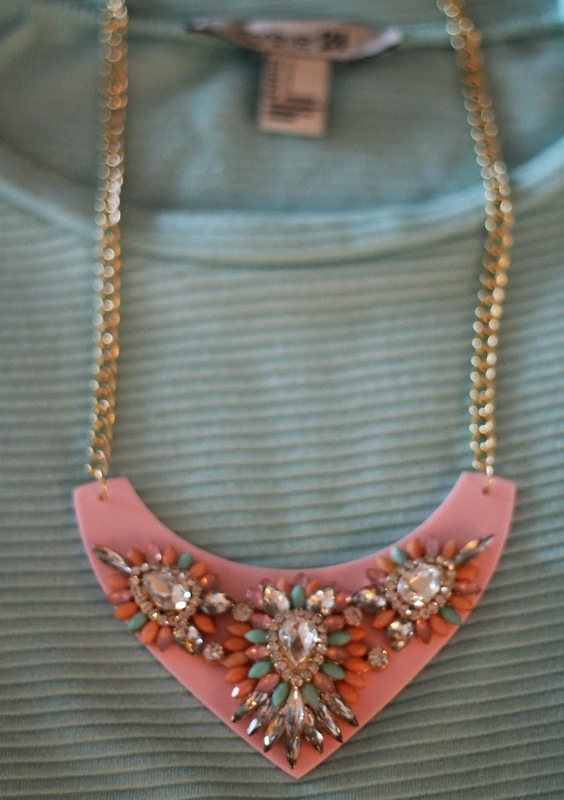 The Kate crystal bib (pictured below) is the perfect statement necklace for Spring! 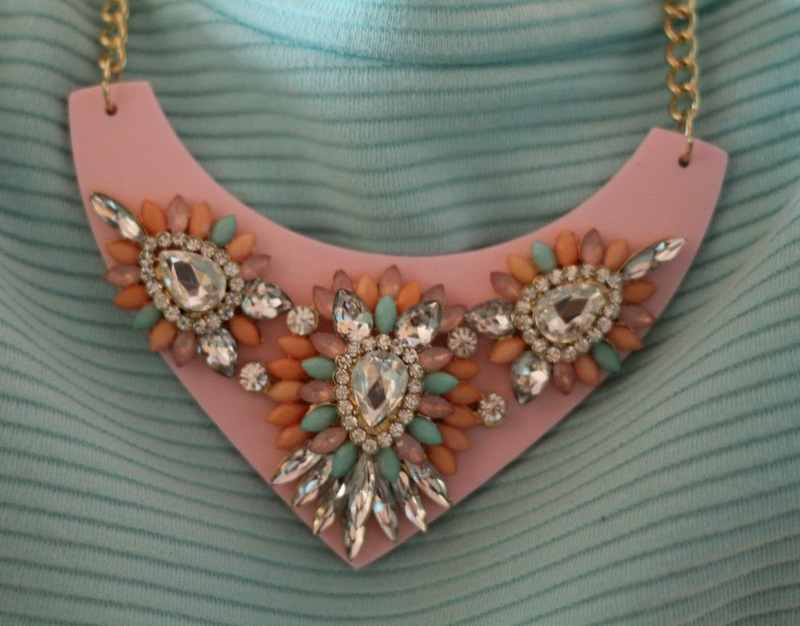 Pastels are always huge in Spring time. I know I will be wearing mine all of the time..
Adorable jade! Love this T and I am all for statement piece jewelry!! :) you look great. Love the pop of color in the blazer. Absolutely love that pink blazer! In love with this outfit! Your blazer is beautiful! LOVE the bag, blazer and necklace. AMAZING. 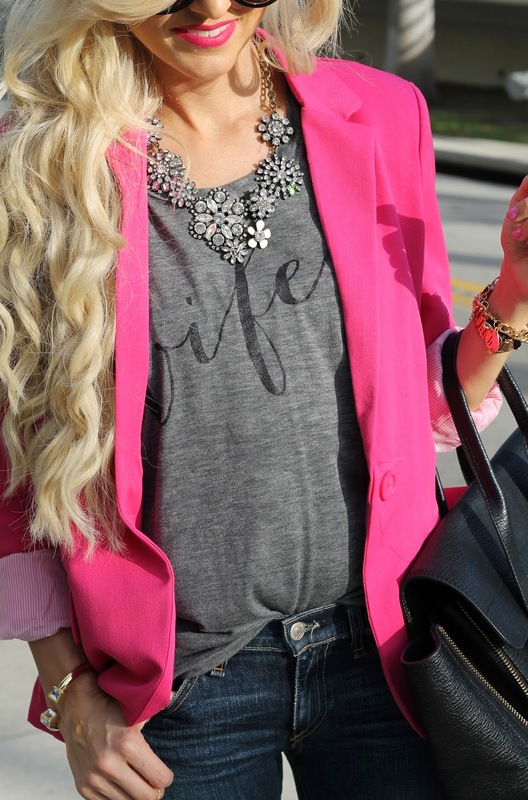 Love the idea for a casual Vday, the hot pink blazer is so much fun! Love this look on you! I've been wanting the Wifey t-shirt for sooooo long...really double crossing my fingers for this one!!!! A casual shirt and statement necklace is absolute perfection in my book right now! You look gorgeous. I adore this look! I love a t-shirt and blazer combo, and the hot pink is awesome! Perfect! I love this entire look! The bright pink jacket and silver shoes dress the entire look up completely. I love it. Loving those shoes and the tee!! eee I want! I am obsessed with this tee! Obsessed with this look! Your outfits have been on point lately! Absolutely love that t-shirt! I'm going to have to try and find one similar in the UK- but it wont be as good I just know it! This is the most adorable giveaway and perfect for Valentine's Day! I've been wanting this wifey tee for so long, and now that I'm engaged I really think I need it! I love how you styled it too! So fun and chic. so cute! love how you styled a casual valentine's day outfit, still perfectly festive! !